Dallas, TX. An O-101 1796 15 Stars half dollar (Lot 2018), certified AU58 by PCGS is joined by many other gold and silver rarities in Heritage’s Long Beach Signature® Auction, being held Sept 17-21, 2008. Heritage is also holding auctions featuring U.S. Currency, Ancient & World Coins, World Currency, and Tokens and Medals. The auctions are now posted by Heritage Auction Galleries on their HA.com website, and all lots are available for inspection and bidding. 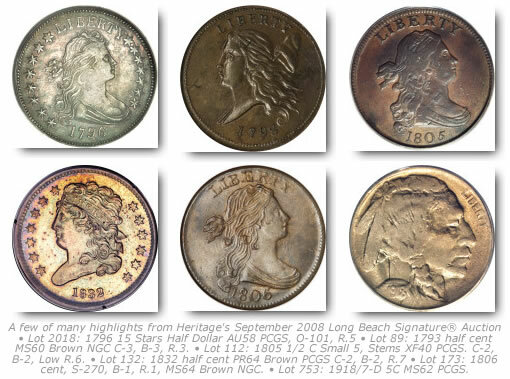 “Among the great rarities included in the Long Beach auction,” commented Heritage President Greg Rohan, “are several unusual pairs: A pair of 1879 $4 stellas (Judd-1635, Pollock-1833) with Flowing Hair, and certified by NGC (Lot 3570 is PR64 Star Cameo, and Lot 3571 is PR65 Cameo). A pair of early $5s from The Laredo Collection is also significant: Lot 3575 is a 1795 $5 Small Eagle (BD-1), certified MS62 NGC, and Lot 3587 is an 1805 $5 Close Date (BD-2). A pair of 1839-O Capped Bust, Reeded Edge Proof half dollars will keep seasoned numismatists talking for decades. Among the anchors in the U.S. coin catalog are: The Nora Bailey Collection; The Bell Collection; The Davis Conway Collection; The Morton J. Greene Collection; The Hamous Collection of California Gold; The Laredo Collection; The Malibu Collection; The Mississippi Collection; The Menlo Park Collection; The Nevada Collection of Seated Quarters; and The Sundance Collection. Lot 89: 1793 half cent MS60 Brown NGC C-3, B-3, R.3. The 1793 half cents were the first of the denomination coined at a young Philadelphia Mint, and they followed the Chain and Wreath cents into production. Lot 112: 1805 1/2 C Small 5, Stems XF40 PCGS. C-2, B-2, Low R.6. This is an important example Census level example of the rarest 1805 half cent, and one of the rarest Draped Bust half cent varieties. From The Nora Bailey Collection. A significant rarity, with only a handful of proofs of this variety known. Lot 173: 1806 cent, S-270, B-1, R.1, MS64 Brown NGC. A remarkable large cent, this is the single finest certified by NGC; as a comparison, the incredible Walter Husak Collection auctioned by Heritage on February 15, 2008 contained ‘only’ an AU50! Lot 753: 1918/7-D 5C MS62 PCGS. The present example, scarce in this grade, shows significant die erosion, as the die crack runs all the way down to the corner of the Indian’s mouth, the most advanced state of the dies we have ever seen for this particular rarity. Lot 833: 1937-D 5C Three-Legged MS65 PCGS. The 1937-D Three-Legged nickel is one of the more significant and famous varieties in American numismatics, and only four have been certified finer by PCGS. The Panama-Pacific International Exposition, held in San Francisco, ran from Feb. 20 through Dec. 4, 1915, on a 635-acre site near the present-day Marina. Lot 1270: 1915-S $50 Round Panama-Pacific MS64 NGC. CAC. Designer Robert Aitken’s fifty dollar commemorative continued the classical allusions of the renaissance that began with Augustus Saint-Gaudens in 1907, and also celebrated the recovery of the “City by the Bay” from the devastating Great Earthquake and Fire. Lot 1271: 1915-S $50 Octagonal Panama-Pacific MS64 NGC. CAC. This is a wonderful realization of Aitken’s design, with brilliant luster cascading from the surfaces, which are predominantly orange-gold on each side. Lot 1298: 1926 $2.50 Sesquicentennial MS66 Star NGC. Only five 1926 Sesquicentennial quarter eagle commemoratives have been awarded the coveted Star designation by NGC, with the finest being two MS66 specimens. Lot 1300: 1903 Jefferson Gold Dollar, PR67 Ultra Cameo NGC. One of two gold commemoratives struck to help offset the cost of the Louisiana Purchase Exposition, held in St. Louis to celebrate the 100th anniversary of this monumental event. Lot 1352: 1853 50C Arms of California 50 Cents, BG-435, Low R.5, MS62 PCGS. This date has always been one of the most sought-after in the popular California fractional gold series, with the distinctive obverse modeled after the state arms. From The Hamous Collection of California Gold. Lot 1533: 1864-S quarter, MS64 PCGS. One of the finest known survivors, from The Nevada Collection of Seated Quarters. Lot 1538: 1872-S Quarter, MS66 PCGS. The incomparable Norweb example, ranking among the most challenging Motto Seated quarters. From The Nevada Collection of Seated Quarters. A lovely set from an important year for numismatic varieties. Lot 1555: 1792 half disme, Judd-7, Pollock-7, R.4, VF35 NGC. CAC. The famous 1792 half disme is one of the most coveted issues in all of American numismatics, and is rightly an important piece of history as well as a numismatic rarity. Lot 1628: 1796 10C AU55 PCGS. JR-1, R.3. The usual die state, with clashmarks along the profile and a prominent cud beneath star 1. Lot 1631: 1802 10C AU55 PCGS. JR-4, R.4. The JR-4 die combination is the most plentiful of four known varieties of 1802 dimes, yet it is still rated R.4, meaning fewer than 200 are known – but only five have been certified finer! Lot 1699: 1885 10C PR69 Cameo NGC. From a proof mintage of 930 pieces, this spectacular coin is a numismatic miracle, and certainly the finest known. Lot 1742: 1916-D Mercury dime, MS65 Full Bands NGC. The entire mintage of 264,000 dimes was produced in November 1916, when production at the Denver Mint was devoted to quarters. Lot 1772: 1942/1 Mercury dime, MS66 Full Bands PCGS. This exceptional coin is tied for the finest certified, and as such is a prize for the Registry Set collector or 20th century series enthusiast. Lot 1796: 1968 10C No S PR68 PCGS. Proof production resumed in 1968 after a three-year experiment with special mint sets, and during the first year, one proof dime obverse die failed to receive a mintmark. Lot 1815: 1796 quarter XF40 NGC, High 6. B-2, R.3. The Draped Bust, Small Eagle quarter dollar is a single year design and the first year of issue for the denomination, and this is an attractive, well balanced representative. From The Menlo Park Collection. Lot 1887: 1883 quarter PR68 Cameo NGC. CAC. Business strike mintage of quarters in 1883 was a minuscule 14,400 pieces, with a further 1,039 proof quarters. Lot 1950: 1916 Standing Liberty Quarter, MS66 Full Head NGC. Ex: Richmond Collection, this Premium Gem first-year 1916 quarter is virtually the finest quality obtainable, with silver-white surfaces and deeply frosted texture. Lot 1973: 1918/7-S quarter MS62 PCGS. The 1918/7-S overdate is the only Standing Liberty quarter that successfully competes with the first-year 1916 issue in terms of desirability and rarity. Lot 2017: 1796 half dollar, 15 Stars, VF25 PCGS. O-101, R.5. Mintage of the 1796-1797 Draped Bust Small Eagle design type totaled only 3,918 coins, and this example is sharp for its grade, with individually distinctive denticles. From The Menlo Park Collection. The Draped Bust Small Eagle half dollars of 1796 and 1797 is rare in any level of preservation, and especially in this high grade (only two of which rate AU58). Ex: The Douglas L. Noblet Collection; The Richard Genaitis Collection. Lot 2163: 1839-O 50C Capped Bust, Reeded Edge PR62 NGC. Substantially rarer than the 1838-O proof half dollars are the similarly designed 1839-O proof halves. With two of only four confirmed extant examples in this auction, this will be a historic event. Lot 2164: 1839-O 50C Capped Bust, Reeded Edge PR63 NGC. Relatively little is known about this enigmatic issue, one of the hidden jewels of the numismatic world; two things are certain–they are indubitably specially struck coins and there are only four confirmed examples extant. The current auction is a landmark event in that we are offering two pieces! The present specimen is the Breen Proof Encyclopedia Plate Coin. Ex: Krouner Collection; George Byers Collection. Lot 2167: 1839 50C Drapery MS65 NGC. Although the No Drapery variant is slightly less available than With Drapery halves in Mint State, both types are equally rare in Gem or better condition. aggressive bidding competition. From The Sundance Collection. Lot 2178: 1849-O 50C MS65 NGC. Like many antebellum minor silver issues, this heavily circulated New Orleans half dollar is immensely elusive in the better Mint State grades; this is tied for the finest known. From The Sundance Collection. Lot 2224: 1870-CC 50C AU50 NGC. As is the case with the many other issues struck in the first year of operation for the Carson City Mint, the 1870-CC halves rank as the most challenging and desirable within their series. Lot 2225: 1870-CC 50C AU50 PCGS. WB-101. Extremely scarce overall and of the utmost rarity in high grades, the 1870-CC Seated half dollar is an important key date in the series. Lot 2241: 1877-S 50C MS67 NGC. Tied with two others for finest known. From The Sundance Collection. Lot 2246: 1848 50C PR64 NGC. This extraordinarily rare 1848 proof half dollar, pedigreed to the Eliasberg Collection, is the second finest known. From The Sundance Collection. Lot 2247: 1849 50C PR66 NGC. We believe this piece, ex: Pittman, is the finest of just six or seven 1849 proof half dollars currently traced. From The Malibu Collection. Lot 2249: 1855/54 50C PR64 PCGS. FS-301, formerly FS-005, WB-102. The 1855/54 is very rare in proof format, and only one has been certified finer. From The Sundance Collection. Lot 2254: 1865 50C PR67 Cameo NGC. NGC has certified just 33 1865 Cameo proofs, with this piece tied with only one other at the Superb Gem level, and none finer (8/08). From The Sundance Collection. Lot 2264: 1873 50C Arrows PR66 Star NGC. Lush ocean-blue, honey-gold, apricot, and cherry-red invigorate this precisely struck and unabraded Premium Gem; only one has been certified finer. From The Malibu Collection. Lot 2294: 1896 50C MS67 Star NGC. The 1896 has one of the lowest business strike mintages (950,000 pieces) in the Barber half dollar series, and this is tied with just one other for finest known. Lot 2371: 1795 $1 Flowing Hair, Two Leaves, B-3, BB-11, NCS. Unc Details. This piece is boldly defined with full definition on both sides, and despite some field repair, it may still qualify as the finest known example of the variety. Lot 2397: 1798 $1 Large Eagle, Pointed 9, B-13, BB-108, R.3, MS61 NGC. The obverse is easily identified by a die flaw between the bust and star 13, and there is a die crack from the rim to the lower right serif of the L in LIBERTY. A spectacular representative from the first year of the Heraldic Eagle reverse. A significant amount of research has been done regarding the Starry Reverse Name Below Base 1836 dollars; the debate is over precisely when the coins were struck. Lot 2428: 1836 Pattern Gobrecht $1 Name on Base, Judd-60 Restrike, Pollock-65, R.5, PR63 NGC. Silver. Die Alignment IV. The accidental die scratch above the eagle’s wing is evident to the unaided eye, and as related to the medallic-oriented Die Alignment II pieces, each is a so-called Second Original from March 1837. Lot 2429: 1836 Pattern Gobrecht $1 Name on Base, Judd-60 Restrike, Pollock-65, R.5, PR63 NGC. Silver. Die Alignment III. No reverse die scratch is apparent on this piece as the dies were repolished prior to striking, thus eliminating the scratch. Lot 2430: 1838 Pattern Gobrecht $1 Name Omitted, Judd-84 Restrike, Pollock-93, R.5, PR63 PCGS. Silver. Reeded Edge. Die Alignment III. There are two widely separated time periods for the striking of 1838 Gobrecht dollars. The first is in the actual year on the coin, 1838; the Die Alignment III coins show microscopic die cracks through MERI and TE, and were most likely made in the late 1850s. Lot 2431: 1838 Pattern Gobrecht $1 Name Omitted, Judd-84 Restrike, Pollock-93, R.5, PR64 NGC. Silver. Reeded Edge. Die Alignment III. The majority of 1838 dollars are known in Die Alignment III, perhaps produced over three striking periods. Lot 2432: 1839 Pattern Gobrecht $1 Name Omitted, Judd-104 Restrike, Pollock-116, R.3, PR64 NGC. Silver. Die Alignment IV. Two hub changes were made to the 1839 dollars: the addition of feathers along the eagle’s neck, and the effacement of Gobrecht’s name from the base of the rock. Lot 2474: 1858 $1 PR65 Cameo NGC. This brilliant Gem possesses icy devices that exhibit obvious contrast with the unperturbed and glassy fields of this proof-only issue. Lot 2475: 1859 $1 PR66 NGC. This superior No Motto type coin exhibits a penetrating strike, and the surfaces are nearly bereft of contact; only four certified finer. Lot 2476: 1859 $1 PR67 Star NGC. One of the two finest certified with Star designation, of some 800 dollars initially struck in proof format in 1859. Lot 2480: 1861 $1 PR66 Cameo NGC. The proof dollar was originally offered as part of proof sets, and perhaps 700 of the 1000 minted were melted. None finer from either service (8/08). Lot 2492: 1868 $1 PR67 Cameo NGC. This is the single finest Cameo proof 1868 dollar certified by either major grading service. Lot 2494: 1869 $1 PR67 Star Cameo NGC. The proof Seated dollars dated 1869 are in high demand, both as representatives from a pool of only 600 proofs, and also as substitutes for the business strikes of the same year, which are famously challenging in Mint State. Lot 2510: 1874-CC Trade $1 MS65 NGC. A seldom-seen Trade dollar in mint condition as most of the 1.3 million struck were shipped to the Orient. None have been certified finer. From The Laredo Collection. Lot 2546: 1878-S T$1 MS65 PCGS. This coin is a wonderful example of the last year of Trade dollar production. Lot 2859: 1892-S $1 MS60 NGC. The 1892-S Morgan dollar, with its mintage of 1.2 million pieces, was not an issue that attracted particular notice for many years, but is now a classic rarity. Lot 2924: 1895-O $1 MS62 PCGS. The 1895-O has always been something of a darling among Morgan dollar enthusiasts, particularly in higher grades. Lot 2925: 1895-O $1 MS63 ANACS. While the 1893-S issue is arguably the most important and widely recognized of all business strike Morgan silver dollars, the 1895-O follows closely behind. Lot 2979: 1903-S $1 MS66 NGC. A beautiful example of this sought-after date, with only one other certified finer. Lot 2988: 1881 $1 PR67 Cameo NGC. One of only 984 proofs struck this year. Lot 2999: 1896 $1 PR67 Cameo NGC. All in all, great technical quality and aesthetic eye appeal. Lot 3002: 1898 $1 PR67 Ultra Cameo NGC. Proof Morgan silver dollars minted in the years 1895-1898 are known for their high technical quality and beautiful appearance, and the 735 pieces from 1898 are particularly noteworthy in this respect. Lot 3058: 1925-S $1 MS65 NGC. The 1925-S is surprisingly rare in MS65 grade, and none have been certified finer. Lot 3128: 1852-C Gold $1 MS65 NGC. Charlotte produced fewer than 10,000 gold dollars in 1852, this coin appears tied for second finest in the Condition Census with a handful of others. Lot 3147: 1854 Gold $1 Type Two MS63 PCGS. In mid-1854, the Mint attempted to rectify problems caused by the small size of the Type One gold dollar, and the planchet diameter was increased by 2 mm. From The Bell Collection. Lot 3168: 1856-D Gold $1 AU58 NGC. The 1856-D is one of the keys to the series, and always in demand. Only six coins have been certified finer. Lot 3171: 1857-C Gold $1 MS61 NGC. Although the quality of this issue is notoriously poor, this piece exhibits a significantly sharper strike and fewer defects than typically seen. PCGS has certified none finer, while NGC reports only two MS62 specimens (8/08). Lot 3218: 1798 $2.50 AU50 PCGS. BD-2, Low R.5. The top of the 8 slightly overlaps the lower edge of the drapery, and the branch has five berries; either feature is diagnostic for the elusive 1798 BD-2 quarter eagle. Lot 3224: 1825 $2.50 MS61 PCGS. BD-2, R.4. The obverse has a recut 5, and the reverse has the stem ending over the upright of the D; both dies appear to be perfect with no die cracks or clash marks. Lot 3226: 1830 $2.50 AU58 NGC. BD-1, R.4. All Capped Head quarter eagles are scarce or rare, and in 1830 only 4,540 coins of the denomination were minted, and the number of survivors is estimated to be just 80 to 100 pieces. From The Menlo Park Collection. Lot 3227: 1831 $2.50 Quarter Eagle Struck on a Dime Planchet, Good 6 NGC. This is undoubtedly the most strikingly obvious and interesting error we have ever handled, all the more fascinating because it circulated for decades without notice. Lot 3269: 1846-C $2.50 MS62 NGC. Winter 7-F. The 1846-C is a very scarce coin in any grade with only 4,808 pieces struck, and high grade examples are especially difficult. Only four or five pieces are believed known in Mint State. From The Mississippi Collection. Lot 3351: 1875 $2.50 PR65 Ultra Cameo NGC. Since both business strikes and proofs of the 1875 quarter eagle are low-mintage issues, at 400 pieces and 20 specimens respectively, the already-small population of proof survivors faces added pressure from numismatists seeking a business-strike substitute. None certified finer. Lot 3353: 1898 $2.50 PR67 Star Ultra Cameo NGC. From an original mintage of just 165 specimens, it is estimated that between 80 and 100 examples still exist, of which few equal this marvelous specimen. Lot 3421: 1909 $2.50 Roman Finish PR65 NGC. The unpopular matte proof format used in 1908 for gold coinage was modified in 1909 to the so-called Roman (or Satin) Finish, a bit brighter. Lot 3440: 1869 5C Five Cents, Judd-688, Pollock-769, High R.7, PR66 PCGS. One of just three known in Aluminum, an incredibly rare metal at the time. Lot 3452: 1880 $4 Flowing Hair, Judd-1658, Pollock-1858, Low R.7–Copper, Gilt–Genuine PCGS. Struck in copper with a reeded edge, the stella’s gilt overlay is nicely done, with no apparent flakes or prominent blemishes. Lot 3570: 1879 $4 Flowing Hair, Judd-1635, Pollock-1833, PR64 Star Cameo NGC. The four dollar denomination is likely the oddest and most curious denomination in American numismatics, and is much beloved for this and the wondrous design. From The Laredo Collection. Lot 3571: 1879 $4 Flowing Hair, Judd-1635, Pollock-1833, PR65 Cameo NGC. The 1879 four dollar stella is often considered the most popular gold pattern of all time, except for those who collect them as part of the regular coinage as well! Lot 3573: 1795 $5 Small Eagle AU55 PCGS. Breen-6412, BD-3, High R.3. Varieties BD-2, BD-3, and BD-4 show overlapping obverse stars 11 and 12, and star 11 over the Y of LIBERTY, while the reverse wreath of BD-2 and BD-3 each have four berries. From The Menlo Park Collection. Lot 3574: 1795 $5 Small Eagle AU55 NGC. Breen-6412, BD-4, R.5. A number of diagnostics easily identify this variety. All of the 1795 Small Eagles are important as the first gold coins struck by the U.S. Mint. Lot 3575: 1795 $5 Small Eagle MS62 NGC. Breen-6412, BD-1, R.5. This coin is of immense historical importance; it is a high-grade specimen of the first U.S. gold coinage – an odds-on favorite as the first of the 12 different varieties of 1795 Small Eagle struck. From The Laredo Collection. Lot 3577: 1799 $5 Large Stars Reverse MS61 NGC. CAC. BD-5, R.5. Only two of the nine known die varieties of 1799 half eagles had large stars on the reverse, and both are rare. Only 3 have been certified finer (7/08). Lot 3587: 1805 $5 MS65 NGC. Close Date, Breen-6445, BD-2, R.4. The BD-1 and BD-2 1805 half eagle varieties are the so-called Perfect 1, Close Date types, sharing a common obverse with different reverses. From The Laredo Collection. Lot 3592: 1807 $5 Bust Right MS64 NGC. BD-1, High R.4. It is believed that the reverse die used in this marriage was a leftover die from the 1806 production run, based on the combination of the large letters and small stars. Lot 3602: 1810 $5 Large Date, Large 5 MS64 PCGS. Breen-6459, BD-4, R.2. The date is large, with a near-horizontal flag atop the first 1 in the date. The reverse shows a large, squat 5 with the top right portion of its flag pointing directly at the lowest feather tip on the fletchings. From The Laredo Collection. Lot 3604: 1812 $5 MS64 PCGS. CAC. Wide 5D, Breen-6466, BD-1, R.3. The two known 1812 half eagle varieties feature the same obverse and are distinguished by the spacing of the denomination. Lot 3608: 1833 $5 Large Date MS61 PCGS. Breen-6498, BD-1, High R.5. The actual size of the digits is just barely noticeable, but the style of the number punches is distinctively different. From The Laredo Collection. Lot 3631: 1839-C $5 MS63 NGC. Variety 1-A. In 1839 the design of the half eagle was changed to feature Gobrecht’s new stylization of Liberty. Lot 3646: 1844-D $5 MS64 NGC. Gold was discovered in the Appalachian regions of Georgia and North Carolina during the 1820s, and several private mints were established near the gold fields to allow the miners to avoid the risk and expense of shipping their gold overland to Philadelphia. This is a breathtaking coin, with none certified finer. Lot 3716: 1866 $5 Motto MS63 NGC. All 1866 half eagles struck at Philadelphia were of the With Motto variety. Lot 3781: 1862 $5 PR64 Ultra Cameo NGC. Mint records indicate that only 4,430 business strike and 35 proof half eagles were produced in 1862. Lot 3782: 1864 $5 PR64 Deep Cameo PCGS. The 1864 proof five has a mintage of only 50 pieces; only one has been certified finer. Lot 3783: 1887 $5 PR64 Cameo NGC. The 1887 proof five has the easy-to-remember mintage of the last two years of the date, that is, 87 pieces. Lot 3817: 1796 $10 AU55 NGC. Breen-6832, Taraszka-6, BD-1, R.4. The only known die pair for coinage of 1796, with Mint delivery records indicating 6,934 eagles coined in 1796. Lot 3819: 1797 $10 Large Eagle AU58 NGC. Breen-6834, Taraszka-8, BD-2, High R.4. After producing every authorized coinage denomination in 1796, from the half cent through ten dollar gold, in 1797 the Mint came close to doing it again, omitting only quarters entirely from the lineup. Lot 3820: 1798/7 $10 9×4 Stars XF40 PCGS. BD-1, High R.4. This is the only early gold issue, regardless of denomination, bearing the 9+4 star arrangement. Lot 3821: 1799 $10 Large Stars Obverse MS63 PCGS. BD-10, R.3. Traditionally, the 1799 Small Stars ten has been considered scarcer than the Large Stars variety of the same year, but recent research casts doubt. Lot 3823: 1800 $10 VF35 PCGS. Breen-6842, BD-1, High R.3. The BD-1 is the only known variety for 1800 eagles, with all examples showing star 7 double-punched, and many displaying a die crack along the top of LIBERTY. From The Menlo Park Collection. Lot 3833: 1801 $10 MS63 NGC. Breen-6843, Taraszka-25, BD-2, R.2. Amazingly, the large emission of 44,344 1801-dated tens occurred with only two die pairings. From The Mississippi Collection. Lot 3853: 1846 $10 MS62 NGC. This wonderful coin is tied with one other as the finest known of a meager 20,095 business strikes. Lot 3858: 1846/5-O $10 MS62 NGC. Although undesignated as such on the NGC holder, this is actually an unrecognized 1846/5-O eagle, and as such it is a great rarity in this condition. This overdate coin appears clearly to be well within the Condition Census. Lot 3904: 1874 $10 MS65 NGC. This With Motto Liberty eagle issue is impressively detailed with creamy luster that enlivens the beautifully preserved surfaces; none certified finer. Lot 3908: 1875-CC $10 AU50 NGC. The 1875-CC is one of the rarest Carson City eagles and boasts a diminutive mintage of just 7,715 pieces. Only ten certified finer. Lot 3957: 1906 $10 PR67 Star Cameo NGC. A phenomenal coin, both extremely rare and tied for the finest certified. Lot 3958: 1907 $10 Wire Rim MS65 PCGS. CAC. Mint Director George Roberts, in one of his last official correspondences, mentioned President Roosevelt’s involvement in the production and distribution of the experimental pieces that would later become known as the Wire Rim, Periods variety. Lot 3968: 1907 $10 No Periods MS67 NGC. The 1907 No Periods eagle was the third Indian Head type ten struck at the Philadelphia Mint that year. Lot 3984: 1910-D $10 MS66 NGC. This example features radiant luster and the finely granular surfaces usually seen on this issue. Lot 4118: 1871-CC $20 AU50 NGC. For collectors today, the CC mintmark carries an undeniable appeal, with their romantic associations with the Wild West. Lot 4119: 1871-CC $20 AU58 NGC. Though the 1870-CC double eagle is substantially more elusive and exponentially more famous, the 1871-CC twenty is also challenging and low-mintage. Lot 4353: 1907 $20 High Relief, Wire Rim MS64 PCGS. More than a century after his design for the double eagle first made its way into circulation, Augustus Saint-Gaudens and his coin design legacy have become seemingly permanent fixtures on American coinage. Lot 4354: 1907 $20 High Relief, Wire Rim MS64 NGC. The Wire Rim and Flat Rim ‘varieties’ actually reflect minor changes in Mint apparatus, rather than actual varieties or even die states. From The Mississippi Collection. Lot 4355: 1907 $20 High Relief, Wire Rim MS65 PCGS. CAC. Today, High Relief double eagles are virtually irresistible to collectors, especially when they are as well-preserved as this charming Gem. Lot 4448: 1914-S $20 MS67 NGC. This is the single finest coin certified by either NGC or PCGS. Lot 4479: 1922-S $20 MS65 NGC. While the 1922 Philadelphia issue (with its mintage of fewer than 1.4 million pieces) is available in most grades thanks to extensive repatriation, the 1922-S double eagle was not so fortunate. Lot 4503: 1927-S $20 MS62 PCGS. Despite an initial mintage of over 3.1 million double eagles at San Francisco in 1927, it is highly prized and elusive. Lot 4504: 1927-S $20 MS65 PCGS. The 1927-S has long been recognized as a key date in the Saint-Gaudens double eagle series. Beauty, rarity, and an illustrious pedigree make this coin a prize for the advanced collector. Ex: NERCA; Dr. Steven Duckor (2006); Jay Brahin (2007). Lot 4507: 1929 $20 MS64 PCGS. CAC. Widely recognized as the first of the key issues at the end of the Saint-Gaudens series of twenties. Lot 4508: 1929 $20 MS66 PCGS. CAC. One of the finest known of an issue once renowned as a major rarity. Lot 4509: 1910 $20 PR63 PCGS. To discuss consigning coins or currency to an upcoming auction, please call the Heritage Consignor Hotlines at 800-872-6467 ext. 1000 (Coins); or ext. 1001 (Currency).